This week, we’ve got mazes on the brain, so it’s only appropriate that the folks at ThinkFun sent us a maze-based puzzle game to try out. Join me as we give the full PuzzleNation Blog treatment to Gravity Maze. In a previous review, I accepted the challenge of ThinkFun’s Laser Maze, a logic game requiring players to direct, divert, and split an actual laser beam with mirrors in order to light up various targets on the board. 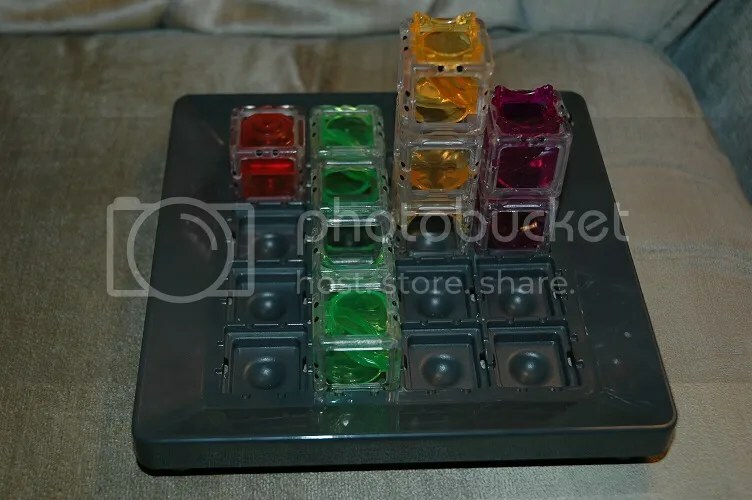 You had to map out the beam’s path in your head and figure out how to place the game pieces in order to hit every target. Impressively, Gravity Maze has raised the stakes, building on Laser Maze’s premise and adding a third dimension. Whereas Laser Maze only operated along length and width to cross the board, Gravity Maze’s falling marble has to be shuttled across the board while descending from its launch point as well. 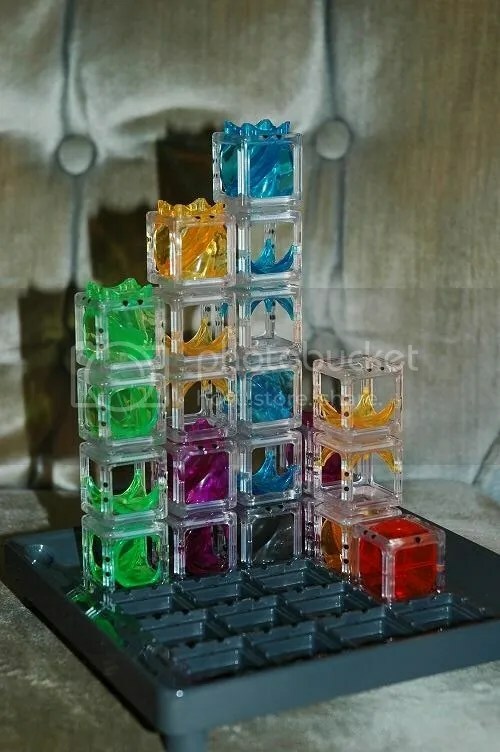 With color-coded tower pieces of various heights and configurations — some levels have ramps to the next lowest level, others have open spaces, and still others house turns for the marble to navigate — it’s up to the solver to add only the pieces listed on the card in order to build the marble’s path to the red target box, each tower clicking into place. There are 60 challenge cards that range in difficulty from beginner to expert. In the earliest challenges, there are only a few pieces on the board, and there’s a clever black dot system telling you which direction each set tower faces. But as you get accustomed to using the towers and move from beginner to intermediate cards, a new wrinkle is added: sometimes, a tower must be placed horizontally in order to complete the path. And as you progress into advanced and expert cards, you have to get craftier. The marble often has to double-back, passing through the same tower multiple times on its way down. You can see the colored ramps that direct the marble from the blue tower to the yellow to the green, and then back across. 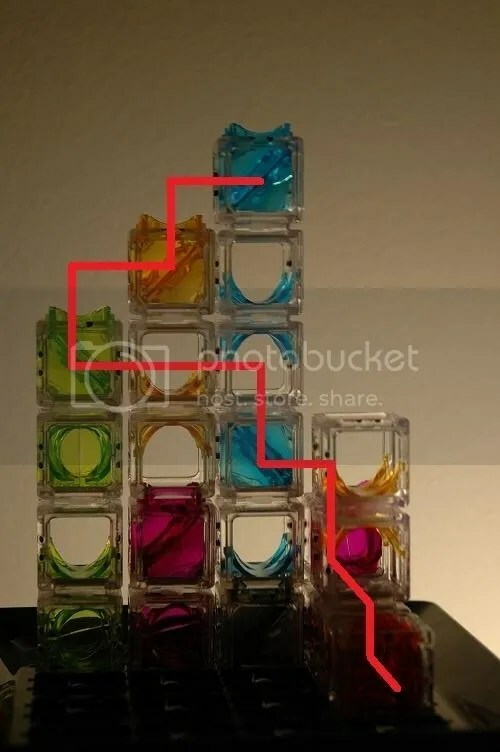 The marble then drops out of the blue tower and into the purple one beside it, where it makes a right turn, passes through the yellow tower, drops into the gray tower, and lands in the red target box. This next-level spatial awareness offers a serious challenge to puzzlers of all ages, and I admit, some of these advanced and experts had me stymied for a bit. Heck, sometimes, a tower must be used horizontally, but above the game board itself. 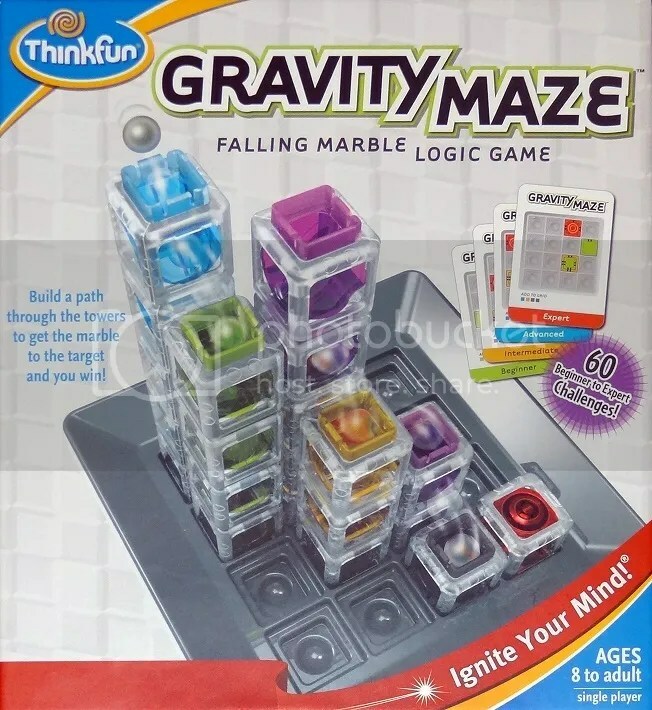 Gravity Maze is easily the most challenging ThinkFun product I’ve had the chance to tinker with, but that didn’t make it any less fun. The box says “Ages 8 to adult,” and I agree wholeheartedly. Puzzlers of any age will enjoy tackling these three-dimensional logic problems and seeing the marble wend its way into the target box. 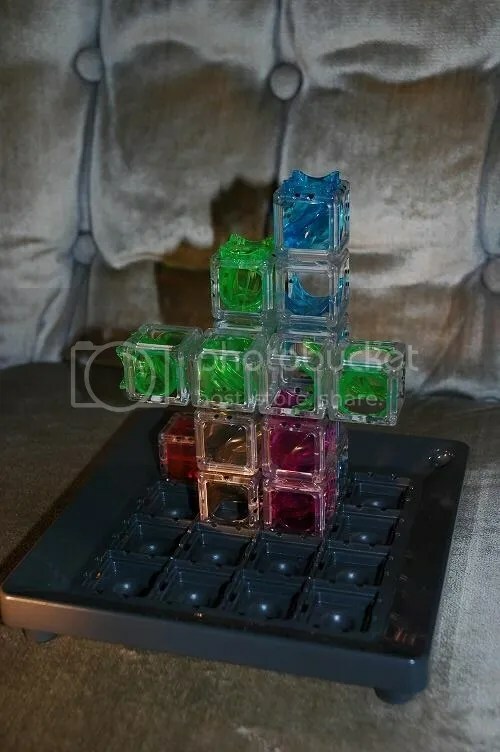 This entry was posted in Games, Kids, PuzzleNation, Puzzles and tagged games, Geeking Out, gravity, Gravity Maze, Holiday Gift Guide, Laser Maze, logic, marble, maze, mechanical puzzle, Pop culture, product review, PuzzleNation, Puzzlin' fool, ThinkFun by gmdirect. Bookmark the permalink.